This beautiful Mediterranean style house, surrounded by a large and lush garden,enjoys a perfect position: it is located a few hundred meters from the main square of Borgo Bonsignore and the beach reachable in about 10 minutes on foot, but at the same time, it is immersed in the peaceful countryside. Moreover you will reach many cultural sites and natural reserves of inestimable beauty in a short drive. The house is on one level and is composed of kitchen-living room equipped with air conditioning, table, chairs and television; laundry room adjacent to the kitchen; two colored and very bright double rooms, both provided with fan; a bathroom with shower. The house is equipped with free WiFi, private parking and barbecue. The large outdoor patio, furnished with wicker furniture, beautiful wooden table and chairs, is the most beautiful point of the property. 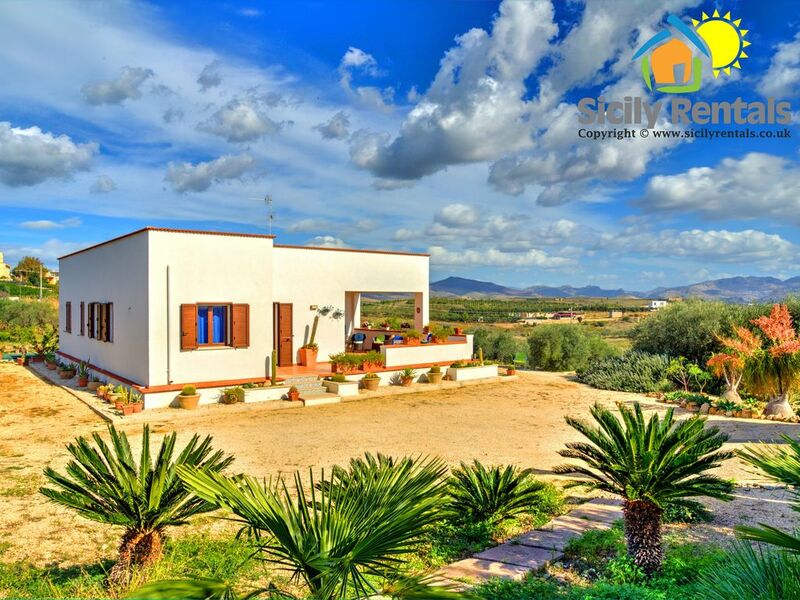 In fact, it overlooks the valley and offers a gorgeous panorama: the Sicilian countryside and in the background, the sea of one of the most beautiful reserves in the area, the “Foce del Fiume Platani”. After an initial hiccup in following the directions, the Q8 filling station referred to as the waypoint to look for before turning off the main road is no longer there resulting in a lengthy delay, we eventually landed up in the rather bleak looking piazza of Borgo Bonsignoro which was totally deserted and relieved only by a friendly pizzeria, there we were met and taken to the villa by the owners mother and her friend, neither of whom spoke any English, however the friend spoke good German and as my wife is German there was not a communication problem. The villa is a compact two bedroom design with a large kitchen the major feature being the verandah which is covered and open on two sides, marvellous for meals, relaxing etc. The views are superb. It is surrounded by an interesting garden with many different types of cactus etc and the whole area is secured by a lockable sliding gate. We were unfortunate with the weather, it rained for three days and was windy every day, this didn't detract from our enjoyment of the holiday though and we managed to visit Agrigento, Marsala etc which is well worth the effort. We did visit the long sandy beach, the weather prevented any swimming but it is clear that on a calm day the beach would be a major attraction. What a warm welcome on arrival from our hostess to her lovely home. A great way to start a week of peace, quiet, sun, sea and sumptuous food in a beautiful rural setting on the edge of the village of Borgo Bonsignore. The beds are comfortable and the house is very well equipped and attractively furnished and decorated. In less than 5 minutes by car you can be at the lovely local beach: ideal for pre-breakfast and sunset dips in the sea. Bring your own food, drink and shade! Our favorite beach was about 20 minutes by car to the South-East at Bovo Marina where you can rent shade on the beach and choose from a range of restaurants. A car is a necessity here, and with it, you can strike out to see a range of local sights including Agrigento (the famous Valley of the Temples) and the mountain town of Caltabellotta. You can also enjoy the evening seaside promenade in Seccagrande and the amazing and surprising food at Quelli Di Piana Grande and Don Pablo at Bovo Marina. We booked this villa for a 2 week honeymoon stay and this villa exceeded our expectations! The communication prior to our arrival was excellent and all our questions were answered promptly. The hosts were fantastic at responding to text messages and arranged to meet us in the main square at Borgo Bonsignore to show us the way to the villa. The hosts took time to show us where everything was which was very helpful. The villa itself is exactly as shown in the photos. The kitchen was well equipped with everything we needed for cooking our own meals. There were also plenty of towels and essential bathroom items and the beds and pillows were very comfortable. We were touched by the kindness of the hosts who had left us a small honeymoon hamper of wine, biscuits, jam etc and orange blossom branches left outside to fill the villa with a romantic scent! They were helpful throughout our stay and when the internet stopped working, they quickly responded to text messages and resolved the problem super quick. They really are five star hosts who made every effort to meet our needs and make us feel comfortable. We thoroughly enjoyed making use of the outdoor space which overlooks olive groves and has a beautiful view of the mountains. We did not tire of the view and indeed, at times it felt we were in a dream, it was so idyllic! The scent of orange blossoms in the evening was wonderful and all day, the surrounding area was calm and peaceful making for a truly relaxing stay. The villa is in a tiny village, a short walk to the beach and the Riserva Naturale Orientata Foce del Fiume Platani where we enjoyed daily walks and sunsets on the beach. Borgo Bonsignore itself had no facilities, however the nearby town of Ribera was a 10-15 minute drive away and had everything we needed (supermarket, petrol, etc). There were plenty of restaurants in the the local seaside villages/towns and an excellent gelateria in Seccagrande. It is also an ideal location to explore the southern coast as well as some of the interior towns and we were easily able to complete daytrips to Agrigento, Marsala, Mazara del Vallo as well as exploring nearby villages and towns not in the guidebook including the Torre Salsa reserve. All in all, an excellent stay and would highly recommend this to anyone looking for a quiet retreat close to nature and away from the usual tourist track. thank you for your beautiful review! Both the owners and I work really hard to have always happy and satisfied guests and also to leave in the heart of tourists a beautiful memory of our amazing Sicily! Thank you again, we hope to host you back in the future. schönes Haus, fern der touristischen Zentren. Zum Naturschutzgebiet und Strand nur 10 Min. zu Fuß. Küche ist zum Kochen prima ausgestattet. Terrasse ist teils überdacht, teils sonnig.Ist also für jeden was dabei. Leider war die ausgeschriebene Zentralheizung nur ein Heizlüfter, aber es war März und es hat gereicht. Sehr nette Vermieter und total unkomplizierte, sowie schnelle Übergabe. Haben uns sehr wohl gefühlt. Ein grosszügiges Haus auf einem liebevoll angelegtem Grundstück. Das Highlight war die große überdachte Terrasse. Alles war sauber, wir haben die Zeit sehr genossen. Die Kommunikation verlief reibungslos und wir wurden trotz der späten Ankunft in Borgo abgeholt. This house is located in Ribera, a village known as “City of orange” for its international oranges production all over Europe. The pleasant summer nights are livened up by culinary feasts, music entertainments, cultural festivals and a lot of other events. Moreover, the town has recently got the acknowledgement of “City slow”, thanks to its care in improving citizens’ and guests’ wellness. The house will offer you this and a lot more. You will experience the emotion of a special vacation combining the typical rustic quietness, magic landscapes, sea and natural paradises but also marvellous cultural routes.